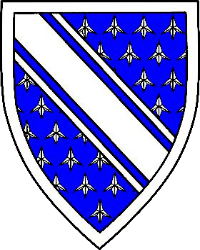 Azure semy of caltrops, a bend cotised within a bordure argent. Device registered with the College of Arms in September 2011. Device image courtesy of Cataldo Querini.